First and before saying anything..check out the original scan . i always wanted to make it 3D so..i hope i did well. Like I said on AP, great work! ... especially those eyes! Lain wallpaper! Long time never seen her wall. its the 1st time in a long,long time that i dont see a lain wall, specially so good as yours, great job! Wow! It's very reaistic! 4d! And your style in general! The only thing I dislike is her mouth. She could probably do with some lips. I Always admire your art! this ones better than the previous paintings..awesome work. Great wallpaper overall, Keep your gorgeous work up! 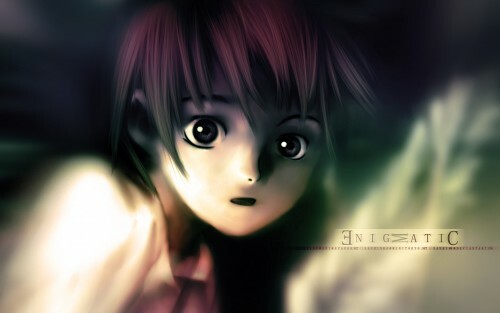 Lain looks really beautiful here! I love the colors you used. Bye. wow! awesome work! soooo nice!